Barathrum, the Spirit Breaker, is a Strength hero that excels at ganking unsuspecting targets from anywhere on the map. His signature ability Charge of Darkness has global range, which means that he can cast it on any target regardless of where he is on the battlefield. Upon using Charge of Darkness, Spirit Breaker makes a beeline for the target at high speed, ignoring terrain and normal pathing in the process. This goes hand in hand with his passive skill Greater Bash, as Charge of Darkness applies it upon making contact with the target. The target is sent flying a small distance, and cannot act during the bash effect. Greater Bash also extends to his right click attacks, which can be infuriating to enemy heroes if luck is on his side. Once he is able to close the distance, Spirit Breaker can follow up with his ultimate ability Nether Strike, which deals a chunk of damage as well as another Greater Bash. His second passive ability Empowering Haste adds to his damage output, depending on how much movement speed he has. His kit makes gives him an oppressive presence, which is felt in every lane so long as he has the mana to cast Charge of Darkness. This makes him great in drafts that rely heavily on early game kills, and need a hero that can rotate without having to use Town Portal Scrolls. That said, however, some game sense is required to make the most out of Charge of Darkness, particularly with regards to enemy vision. Without proper initial positioning, charging in blindly without concealing oneself first in the fog of war will make it easy for the enemy team to see Spirit Breaker coming—simply by looking at the minimap. Moreover, he is not great at pulling off comebacks from a significant deficit. Spirit Breaker has pretty much no scaling to speak of, and thus cannot contribute to a comeback effort outside of keeping a single hero locked down. He also does not have anything in the way of area of effect crowd control, save for the “bowling ball” effect of Charge of Darkness. Of course, luck can come into play even in the late game with Greater Bash procs, though naturally this is unreliable. Despite his weaknesses, though, Spirit Breaker’s purpose is crystal clear, and can serve as the platform on which your true win condition (i.e. a late game carry) can stand on. Enemy heroes must always keep tabs on him as well, adding a layer of pressure onto the game. If you and your teammates can leverage his ganking power early and often with the proper composition, Spirit Breaker might just be the piece that helps you win the game. Building Spirit Breaker’s kit is not complicated at all, and rarely changes from game to game. Your first skill point should go to Charge of Darkness, as it serves as a good deterrent when it comes to fighting for the initial bounty runes. Enemy heroes that are out of position from the start can also be exploited almost right away with an early point in Charge of Darkness, though of course you will need the assistance of your teammates in order to get the kill. Your next priority should be Greater Bash, as without it Charge of Darkness is half the ability that it would be otherwise. Level it up alongside Charge of Darkness, trading skill points with it each time you hit the next hero level. That said, it should typically be left at Level 2 in the early game, because it relies pretty heavily on attack speed. More attack speed means more chances to trigger Greater Bash, but suffice to say Spirit Breaker doesn’t have a lot of it early on. Knowing this, we recommend taking Empowering Haste at Level 8, as it gives you and your teammates a small boost in movement speed for the mid game. From there, you can continue leveling Greater Bash in order to maximize its proc chance. Leave the rest of Empowering Haste for later. On that note, we also recommend taking Nether Strike whenever possible, in order to reduce its cooldown for the later stages of the game. As a position 4 support, Spirit Breaker requires a bit of farm to reach peak effectiveness. He is expected to carry items that will benefit the team, which means that aura items and equipment with protective properties suit him well. Pipe of Insight is one of the best pickups for Spirit Breaker, as he can activate it in the middle of a teamfight thanks to his natural tankiness and tendency to not be the opposing team’s first target. The reduction in magic damage can go a really long way in terms of making sure your teammates survive engagements, especially against drafts that rely on nukes to bring targets down. Drum of Endurance is another item that benefits the entire team, greatly increasing their movement speed upon activation. This works both for offensive and defensive purposes; gank attempts are made easier when your teammates can run faster, and the same goes for escaping or repositioning against the enemy team. Blade Mail works really well against teams with high damage area of effect spells, such as Jakiro, Queen of Pain, and Tinker. It also works against overeager right click carries, who try to fight Spirit Breaker one on one without holding back. Speaking of carries, though, one should consider buying a Solar Crest and/or Heaven’s Halberd against typical agility cores, in order to neutralize their ability to dish out damage in a teamfight. Crimson Guard serves much the same purpose. Lotus Orb can be a cheeky choice for Spirit Breaker. With it, you can protect high value heroes on your team, while reflecting big single target spells back whence they came. Consider purchasing one if you’re up against a team with multiple natural Scythe of Vyse carriers, or against someone like Doom. Having good vision and Observer Ward placement is the best way to counter Spirit Breaker, since the ability to see him coming in using Charge of Darkness gives your team time to move back into the safety of one of your towers. Kindly ask your position 5 support to ward common Charge paths, and remind your teammates to check the minimap frequently. As for specific hero counters, supports with low cast time stuns are perfect against Spirit Breaker. He is, after all, vulnerable during Charge of Darkness, and the skill can be interrupted with a well placed stun or disable. It does, however, take some positioning to get this right, since any heroes that are run over by Spirit Breaker during Charge are also stunned in turn. Examples include Ogre Magi, Enigma, Rubick, Outworld Devourer, Shadow Shaman, Lion, and other heroes with similar abilities. You and your team might also want to consider picking heroes like Phoenix and Undying, whose abilities Supernova and Tombstone exploit Spirit Breaker’s awful attack speed. 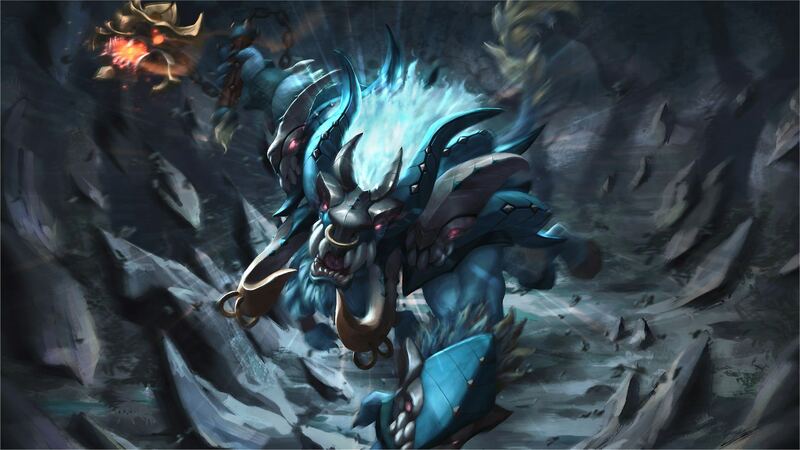 Without the ability to destroy the units that come out as a result of their respective abilities, Spirit Breaker typically has to run away from them rather than stand and fight.